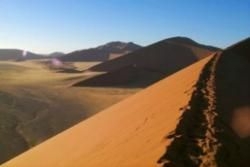 Considered to be one of the most photographed dunes in the entire Sossusvlei area, Dune 45 is so named because it sprawls about 45km from the Sesriem Canyon. Classified as a star dune and stretching about 170m to the skies above, the rich red color of the dune is caused by "rusting" oxide molecules contained within the sands. As the winds play across the desert and coastlines they shape the dunes into beautiful and intriguing formations. The view from the top just before the sleepy sun climbs up behind the horizon is magnificent and quite extraordinary. Although not an easy climb, the reward is well worth the effort!